The final step to the Chiles Center was neither pretty nor hassle-free. Roosevelt made Southridge work for everything it earned in the second round of the Class 6A playoffs, pestering the Skyhawks into an off shooting night and making the Metro League champs sweat long into the second half. Southridge, thankfully, had been down a similar path before. 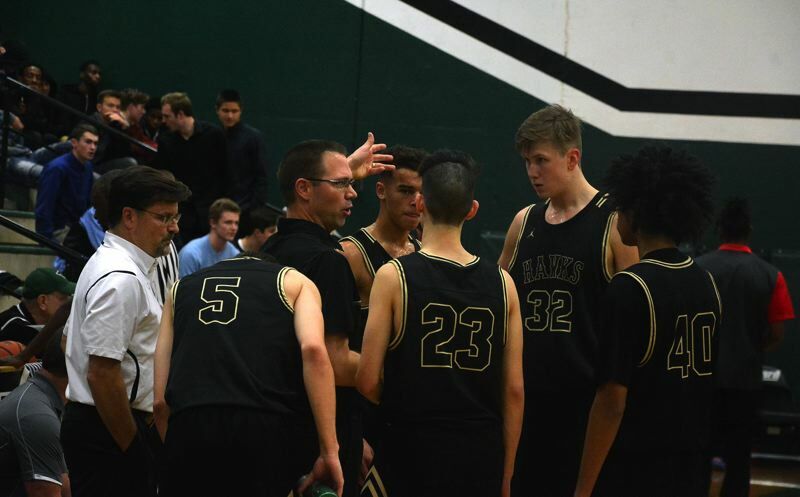 In their two conference clashes with Jesuit and at the Les Schwab Invitational back in December, the Skyhawks had to procure victories with determination and endurance instead of dexterous skill and sprees of scalding outside shooting. Those games prepared Southridge for the types of halfcourt playoff battles that are slower in pace and lower in shooting percentages. When the Roughriders went on their runs and the Skyhawks cooled from the field, Southridge fell back on those lessons learned. They took the ball to the paint, turning down threes. They played through their all-Metro post Filip Fullerton and planted their defensive flag at the other end. Sure, it wasn't the typical high-flying Hawks (23-3 overall) who can pile up 75 points in a game with unreal ease. But in the playoffs a win is a win after beating Roosevelt 63-55 on Saturday, Southridge is going to the 6A state tournament. "Roosevelt came in looking to attack us and battle us," Southridge senior point guard Connor Fajardo said. "It was a tough win for sure. Both teams wanted it. They didn't care who they were playing and they made it tough on us. But even if we're not making shots, even if calls don't go our way, we have to keep battling through the whole game." The No. 3 Skyhawks face No. 11 Lincoln in the 6A quarterfinals on Thursday at 6:30 p.m. at the Chiles Center. Win, and Southridge most likely would face No. 2 Grant in the semis, which would be their third straight PIL opponent. Even with a Metro title and a state tournament appearance in the books, Southridge isn't satisfied. "We still have one more box to check off," Fajardo said with a smile, referring to a state title. "Every team left in final eight is great. There's gonna be a lot of games like this where we have to fight until the end. That's what playoff basketball is all about." In a season chalk full of shooting exhibitions, scoring explosions and highly entertaining hoops, Southridge proved it can grit-and-grind its way to a win if need be. Southridge shot 3-for-19 from the three-point line and made just one trey in the second half. That three didn't come from Bo Quinlan, Zach Galvin or Brock Henry, but burly power forward Kade Hustler. Additionally, the Skyhawks made only 8-of-17 attempts at the free throw line. Both showings were far cries from Southridge's customary killer efficiency shooting the ball. But it was spurts such as Henry's personal 6-0 spree in the second half and Fullerton's strong play on the low block that ensured Southridge's shot at the tourney. Southridge's scoring was balanced across the board. Five different players reached double figures. Quinlan led Southridge with 12 points while Galvin, Fullerton and Henry each had 11. Senior post Bradley Bickler added 10 points (six in the third) for the Skyhawks and Hustler had seven. "We couldn't throw in the ocean from three, so we had to find other ways to score," Southridge head coach Phil Vesel said. "I think it showed some good toughness. At times it's been easy for us this year, so to take that challenge on and find a way to grind out a win, that's part of basketball. Today was a good test and we passed it." "It shows we're a really versatile team," Henry said. "We knew that coming in, but we proved that to ourselves and proved it to the state tonight. It's going to be hard for teams to match up with us inside and outside. That's a good thing going into Chiles. Teams can take one thing away and we can find another way to win." The fact Southridge isn't tied down to one style of play says a lot about the Skyhawks' potential on the state stage. If teams want to get up and down and speed up the game, the Skyhawks can certainly run with the best. Or, if the game slows to a stalemate and their opponent wants to slow the game and duke it out in the halfcourt, Southridge can stand in and swing. "We just try to respond," Fajardo said. "Obviously, it's the playoffs. You look at March Madness, it's the same thing. Every team is gonna throw their blows. Every team is gonna punch and fight back and that's what Roosevelt did. We just had to continue to respond, continue to huddle up, connect with each other. We had to keep fighting and crawling for the Chiles Center." Roosevelt went on an 11-0 run towards the end of the second quarter with guards who attack the rim at will and make a living at the rim. The Roughriders cut Southridge's second quarter lead to 31-29 and stayed within striking range the rest of the way. Yet, Vesel said the Skyhawks dug in defensively, putting up walls around the paint and denying dribble penetration. Quinlan, Henry and Galvin forcefully drove the ball to the basket, not settling for as many threes as normal. And as the clock waned late into the fourth, Southridge's guards closed the game out with smart decisions and sound judgment. "We stayed really composed as a group and finished the game out," Fajardo said.